Hachi: A Dog's Tale is a 2009 English-language drama film. 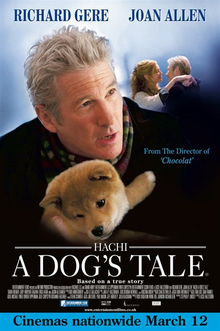 Based on the true story of a faithful Akita Inu, the titular Hachikō, it is directed by Lasse Hallström, written by Stephen P. Lindsey and Kaneto Shindo, and stars Richard Gere, Joan Allen and Sarah Roemer. The film is a remake of the 1987 Japanese film Hachikō Monogatari. Hachi: A Dog's Tale premiered at the Seattle International Film Festival on June 13, 2009, and its first theatrical release was in Japan on August 8. Sony Pictures Entertainment decided to forgo a U.S. theatrical release. The film was given a UK theatrical release on March 12, 2010, courtesy of Entertainment Film Distributors, and opened in over 25 countries throughout 2009 and 2010. The film's foreign box office returns total $46.7 million as of January 2011. "A Dog's Tale" is based on a true story of the love and devotion between a man and a dog. The story is told by Ronnie who is the man's grandson. When Ronnie has to give a presentation at school about a personal hero, he chooses to tell the story of his grandfather's dog Hachiko ("Hachi" for short). Despite his classmates laughing, Ronnie describes how his grandfather, Professor Parker Wilson, finds a lost puppy which had been freighted to America from Japan but was accidentally left at the train station of the professor's small hometown. The professor ends up taking the puppy home, planning to search out its intended destination and send it on to its rightful owner. However the puppy's owner cannot be found and Parker and the puppy begin to form a close bond. Although Parker's wife, Cate, is opposed to keeping the puppy she eventually relents after realising the bond between Parker and Hachi. Over the next year or so Parker and Hachi become even closer. Parker tries to train Hachi, a Japanese breed of dog called an Akita, but the dog refuses to do normal dog things like chasing and fetching. One morning Parker leaves for work and Hachi follows him to the train station and refuses to leave without his master causing Parker to abandon the train to take the dog home. The next day Hachi follows Parker again who this time gets on the train. When Parker returns to the train station after work he is surprised to find Hachi waiting for him. Hachi learns what time that Parker will be due home every day and constantly goes to the station to wait for him at 5:00pm, quickly becoming their new daily routine. One winter's day, Parker suffers a fatal and unexpected brain hemorrhage while at work and thus never returns home on the train as usual. Hachi, waiting in his usual place for Parker as the train pulls up, doesn't see his master disembark, and instead patiently waits and waits for hours even as it starts snowing. Eventually Parker's son-in-law, Michael, comes to get him. Although everyone tries to make Hachi understand that Parker has gone, Hachi is apparently unable to accept that his master won't be coming home. Instead he returns to the train station each day and continues to wait. As time passes, Cate sells the house and moves away. Hachi is sent to live with Parker and Cate's daughter Andy, her husband Michael, and their baby Ronnie. However Hachi escapes and finds his way back to the station. There he sits at his usual spot. Andy arrives and takes him home but soon realises how sad the dog is, especially as he even refuses to eat. It breaks her heart but she slowly opens the gate knowing Hachi will return to the station. Each and every day Hachi waits for his best friend. As night falls, he sleeps in the rail yard. The train station workers who knew the professor well become fond of Hachi and provide him with food and water on a daily basis. On the tenth anniversary of Parker's death, Cate returns to the small township to visit her late-husband's grave. She is stunned to see a now very elderly Hachi still waiting at the station. Overcome with grief Cate sits and waits for the next train with him. At home, Cate tells the now ten-year-old Ronnie about Hachi. Meanwhile the ever-faithful dog continues waiting until one day he is seen laying very still in the snow, comforted by a vision of Parker who appears and lovingly beckoning the dog to come to him. Ronnie concludes his story of why Hachi will always be his hero. Some of the students are close to tears - even those who had laughed at the beginning. After school Ronnie is met by his dad and a new puppy which they've also named Hachi. The film ends with Ronnie and the puppy walking down the same tracks where Parker and the original Hachi had met so long ago. Richard Gere - Professor Parker Wilson; Cate's husband, Andy's father, Michael's father-in-law, and Ronnie's maternal grandfather. Joan Allen - Cate Wilson; Parker's wife, Andy's mother, Michael's mother-in-law, and Ronnie's maternal grandmother. Sarah Roemer - Andy Wilson; Parker and Cate's daughter, Michael's wife, and Ronnie's mother. Robbie Collier Sublett - Michael; Parker and Cate's son-in-law, Andy's husband, and Ronnie's father. The movie was based on the real Japanese Akita dog Hachiko, who was born in Ōdate, Japan, in 1923. After the death of his owner, Ueno Hidesaburō in 1925, Hachiko returned to the Shibuya train station the next day and every day after that for the next nine years until he died in March 1935. A bronze statue of Hachiko is in front of the Shibuya train station in his honor. Hachikō is known in Japanese as chūken Hachikō (忠犬ハチ公) "faithful dog Hachikō", hachi meaning "eight" and kō meaning "affection." The majority of filming took place in Bristol, Rhode Island, and Woonsocket, Rhode Island. The only spoken reference to the actual location where filming took place is when the newspaper reporter Teddy states he works for the Woonsocket Call (Woonsocket's daily newspaper). Additional locations included the University of Rhode Island in Kingston, Rhode Island, along the Providence and Worcester Railroad Mechanical, and the Columbus Theater located in Providence, Rhode Island. A second production unit filmed scenes on-location in Japan. Footage was shot at the (now closed) Reynolds Elementary School in Bristol. The film received mixed or average reviews from critics. Review aggregator website Rotten Tomatoes reported that 63% of critics have given the film a positive review based on 27 reviews, with an average rating of 5.88/10. On May 19, 2012, a bronze statue of Hachiko the dog was placed at the train depot at Woonsocket Depot Square, Woonsocket, Rhode Island, where Hachi was filmed. The train depot at One Depot Square has been named Hachiko Place. The Rhode Island statue's dedication ceremony was part of the Cherry Blossom Festival held in three Rhode Island towns: Pawtucket, Central Falls, and Woonsocket. Dignitaries including the Mayor of Woonsocket and the Consul General of Japan attended the ceremony. Two cherry blossom trees were planted by the statue. A visitor from New Jersey's Akita-mix (also named Hachi) was invited to participate at the ribbon-cutting ceremony as a "real-life stand-in for Hachiko". Animal trainer Mark Harden and his team trained the three Akitas — Leyla, Chico and Forrest — who played the role of Hachi in the movie. Harden adopted Chico after the movie was completed. According to the movie's closing cards, the real Hachiko died in March 1934, while the earlier movie, Hachikō Monogatari, and other sources state that he died in March 1935 (9 years and 9 months after Professor Ueno's death). The ending credits give 2008 as the copyright for the movie. The film score of Hachi was composed by Jan A. P. Kaczmarek. ^ Hachiko: A Dog's Story (2009). Boxofficemojo.com. Retrieved on August 7, 2010. ^ Wong, Vicki Shigekuni (March 30, 2014). "See Actual Hachi Film Locations on Google Maps". Behind the Film "Hachi: A Dog's Tale". VickiWongandHachi.com. Retrieved February 3, 2017. ^ "Hachi: A Dog's Tale (2009)". Rotten Tomatoes. Fandango. Retrieved April 22, 2019. ^ Ganzert, Robin; Anderson, Allen; Anderson, Linda (2014). "Chapter 6: Mark Harden (Los Angeles County, California)". Animal Stars: Behind the Scenes with Your Favorite Animal Actors. New World Library. ISBN 9781608682645. Retrieved February 3, 2017. ^ "Welcome to Woonsocket and the home of the Hachiko monument!" (PDF). hachikousa.com. Blackstone Heritage Corridor, Inc. Retrieved February 3, 2017. This page was last edited on 22 April 2019, at 16:18 (UTC).